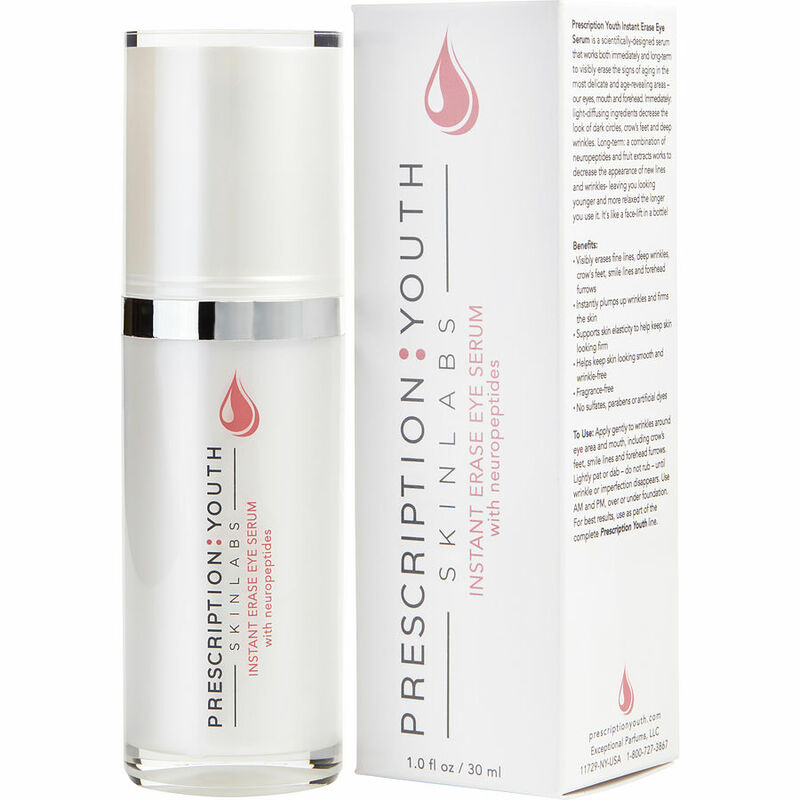 Details: The Prescription Youth Instant Erase Eye Serum is a scientifically designed serum that is exclusively formulated to instantly plump up wrinkles and firm the skin to visibly erase fine lines, deep wrinkles, crow's feet, smile lines, smoker's lines and forehead furrows. It's like a face-lift in a bottle. Pharmaceutical-grade ingredients provide an alternative to botulinum toxin and collagen injections, visibly erasing the signs of aging in just seconds! Results last all day! Enhanced with peptides for longer lasting results. To Use: Apply gently to wrinkles around eye area and mouth, including crow’s feet, smile lines and forehead furrows. Lightly pat or dab – do not rub – until wrinkle or imperfection disappears. Use AM and PM, over or under foundation. For best results, use as part of the complete PRESCRIPTION:YOUTH line. Ingredients: Water/Aqua/Eau, Adipic Acid/Neopentyl Glycol Crosspolymer, Glycerin, Pyrus Malus (Apple) Fruit Extract, Dimethicone, Acetyl Hexapeptide-8, Dipotassium Glycyrrhizate, Panthenol, Tocopherol, Ethylhexylglycerin, Benzyl Alcohol, VP/VA Copolymer, Amodimethicone, Hydroxypropyl Methylcellulose, Disodium EDTA, Carbomer, Sodium Hydroxide, Phenoxyethanol, Potassium Sorbate, Chlorphenesin, Caprylyl Glycol. 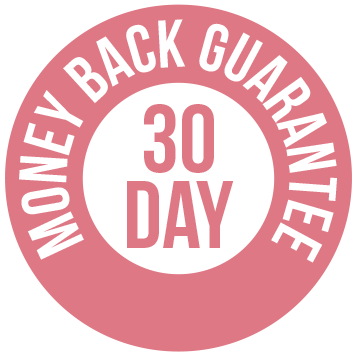 I use this daily and like how quickly the product works. It instantly smooths the fine lines around my eyes. Would highly recommend! So far so good. I've been using the 'eye' product for less than a week and I've seen some amazing results. I hope this continues because I'll gladly invest again in the future! LOVE the instant erase eye serum! Use it everyday. 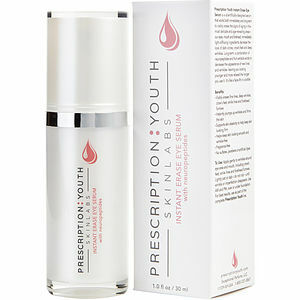 I purchased the prescription youth instant erase eye serum just recently and it's amazing! Best product I've ever used for wrinkles. I use it all over my face and the wrinkles just disappear. Your skin feels so soft and smooth after applying it. Please don't ever stop making this product it's WONDERFUL! This stuff is amazing!!!! I’m a 41 year old man and this stuff removes any lines your eyes. I makes me look 10 years younger. My wife is jealous of my secret. I will tell her eventually so she can benefit from it too.